Water safety and security are important parts of any pool’s operation. In the United States, many regulations exist to help to ensure that the patrons of the swimming facility can use the pool without the worry of injury or death. According to the Centers for Disease Control and Prevention, 10 people are killed in drowning accidents per day. Common injuries sustained in drowning accidents include brain damage as a result of decreased oxygen that can ultimately cause the victim to develop a permanent disability. However, if it is determined that negligence caused the drowning accident, victims and their families may be entitled to receive compensation by those responsible. If you have been injured or a loved one has died wrongfully and you feel that negligence was the cause of the tragedy, Van Sant Law, can help to ensure that any legal matters related to the incident are thoroughly addressed. Our legal team believes that the negligent individual or entity should be held accountable for irresponsible or reckless actions. Contact us today for more information. Drowning is found to be the second most common cause of fatalities in children between the ages of one to four, although any individual is at risk of falling victim to a water-related accident. Incidents that are not fatal may instead lead to severe, long-term complications from decreased oxygen, including a loss of cognitive abilities and brain damage. Swimming pools may pose a significant risk of toxic substance complications and spinal cord injuries if the facility fails to adequately maintain the pool’s chemicals or there is a lack of security around the pool. Water-related claims that involve drowning often allege irresponsible behavior on the part of the lifeguard or other individuals who are supposed to be supervising patrons in and near the open water. 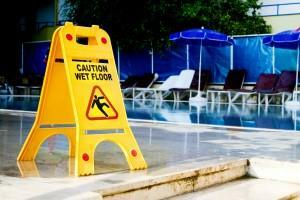 Other claims include cases of premises liability and defective or faulty swimming products. Additionally, if parks, swimming pools, community spas, and other areas for the public are poorly maintained, those who have been injured may be eligible to pursue a personal injury lawsuit due to the state and federal laws that regulate public operating criteria. Spa and pool owners may be responsible for the injuries sustained around on their property if they knew of any potential hazards on the grounds and failed to adequately address these risks. One example could include a failure to hire and train a lifeguard. Those who own private pools are also responsible for supervising swimmers, and these individuals must ensure that access to the pool is restricted when not in use. They might be responsible for injuries stemming from poor maintenance, including broken ladders, drains, slides, or diving boards. Manufacturers of pool equipment could also be liable should the equipment be proven to be faulty, whether it is defectively manufactured or designed. The manufacturer might also be responsible if the company neglects to warn consumers of the dangers of certain products, and pools must have first-aid supplies and working defibrillators should a drowning accident occur. Contact Van Sant Law, today if you have been involved in a drowning accident due to negligence or irresponsibility on behalf of another. We can help to protect your legal rights and aggressively pursue the compensation to which you may be entitled. Our drowning accident attorneys provide knowledgeable, professional, and high-quality legal representation throughout Georgia, and we can help you to hold the appropriate party responsible for your injuries.